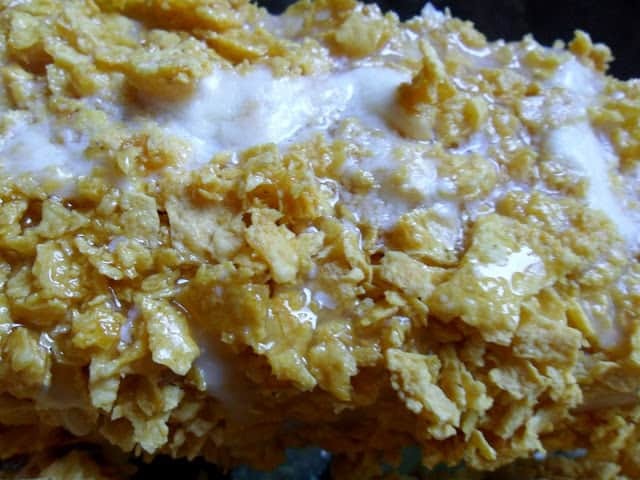 Cornflake Coated Crispy Haddock is simply haddock fillets that are dipped in seasoned Russian salad dressing and then rolled in crushed cornflakes cereal. Drizzling the coated fillets with melted butter before baking makes this haddock wonderfully delicious! If you aren’t a fan of haddock or fish in general, you can substitute boneless, skinless chicken breasts. This recipe turns out fantastic every time we make it. We like to serve crispy haddock with a side of coleslaw and homemade baked beans. In my house we can’t eat a piece of fish, no matter which way we prepare it, without a side of coleslaw and baked beans. Right before serving, you can squeeze fresh lemon juice over your crispy haddock and then serve with tarter sauce. Nothing fancy here, just a good old fashioned fish dinner. In a shallow dish stir together eggs, water, salad dressing, and seafood seasoning. Place crushed cornflakes and chopped pecans in another shallow dish. 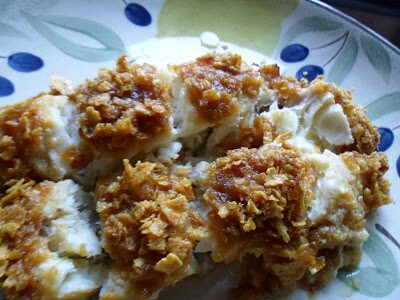 Dip fish fillets in egg mixture, then dredge in crushed cornflakes, coat well. Place coated fillets in a 13 x 9 in baking dish. Drizzle with melted butter, squeeze lemon juice over all. Cover dish with tin foil. Bake for 30 to 35 minutes. Remove foil. 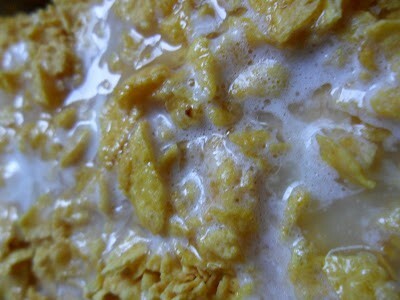 Bake for an additional 15 to 20 minutes or until cereal is golden brown and fish flakes easily with a fork. Shrimp Egg Rolls with Sweet Sour Sauce is a great recipe for egg rolls. Served with a homemade sweet-sour sauce, even better! Looking for more Haddock Recipes?? We have a few you might like to try. Deep Fried Haddock, and Crispy Coated Fried Haddock. I think my kids would get a kick out of helping to make this dish…cereal will be novel for them. thanks for sharing it with us on foodie friday and welcome to the party.